When the crosswalk sign starts flashing don't walk, I hear on the radio that one is supposed to not start walking across the street. However the reality is different. Right after the light turns green and the walk sign says walk, there's often a cue of cars that were stopped at the red light. This cue can now go forward and there's a few cars in the cue that are making the free right turn across the crosswalk. Since they don't always stop when making that turn (even though they should) the crosswalk can be full of cars rounding the corner. There's often more traffic across the crosswalk when the walk sign says walk than there is after the walk sign starts flashing don't walk. When the walk sign is flashing don't walk and the cue of cars has passed, the intersection is often empty. That's when I often run across the street. Bellingham is now installing some flashing crosswalks in areas where there are busy walks with no traffic light. Just push the button and the crosswalk starts flashing. 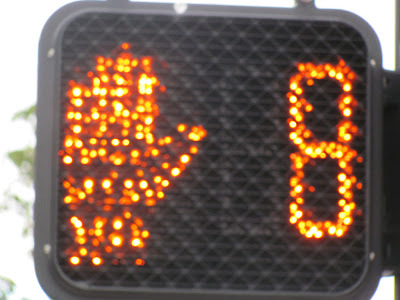 At these crosswalks, I try to be polite and see what's happening with the traffic before I press the button. If cars are just about at the walk, I try to wait till they go past so they don't have to slam on the breaks. Remember, flashing crosswalks don't have a "green, yellow, red" traffic signal. I assume cars are expected to stop as soon as the walk starts flashing. There's no "yellow about to turn red" warning, like there is at intersections with regular stoplights. Keeping this in mind, I try and let the cars that are almost at the walk go on by before I press the button. Then I push the button so cars that are farther back (which are often speeding anyways) have a warning and start to slow down. By the time those cars get to the walk, I've often just finished crossing. Sometimes I jog across the street so as not to hold up traffic for very long at least. One time I accidentally pushed the flashing crosswalk button right as a large truck was about to cross the walk. The truck stopped and I noticed smoke from the tires. Trucks have a lot of inertia so they are often harder to stop on short notice and also it takes more fuel to get going again. I didn't see if the driver was upset or not, but later I had a discussion on Facebook with a friend of mine who is a former truck driver. I ask him if the driver would have been upset and his response was, good drivers realize "it comes with the territory." We do the best we can and there usually isn't much point in snarling about things. If more people took that attitude, the world would flow a lot easier. Fancy Bellingham crosswalks that didn't work out well in the long run.